Protect your feet by making sure that they are well supported. Are you suffering from foot pain or calluses? It doesn’t really matter if you have been running for years or you are just starting out, suffering from foot pain can affect even professional runners. 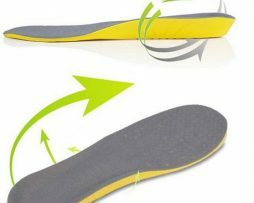 If you are not wearing the correct supportive insoles or none at all you may have become accustomed to aches, pains and soreness after rigorous exercise, running or even simple jogging. 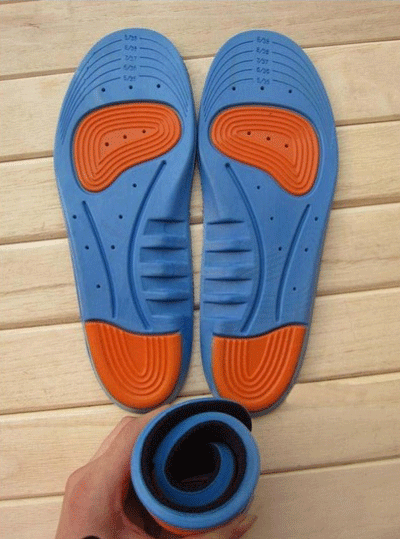 This discomfort can become a thing of the past with simple lightweight perfect fit running insoles. One of the main running injuries, plantar fasciitis, is caused by the stress and strain of running when the plantar fascia becomes inflamed. This common injury can put runners out of action for a considerable time until the ligament heals. After repeated stress injuries the time taken to heal becomes longer, obviously the best way to avoid these long and painful periods of recovery is to prevent the injury in the first instance by being prepared and protecting your feet with sports insoles. 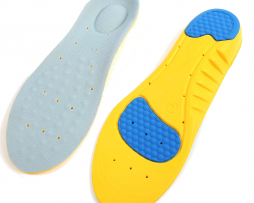 Our running insoles are designed to be practical and light weight when you run. 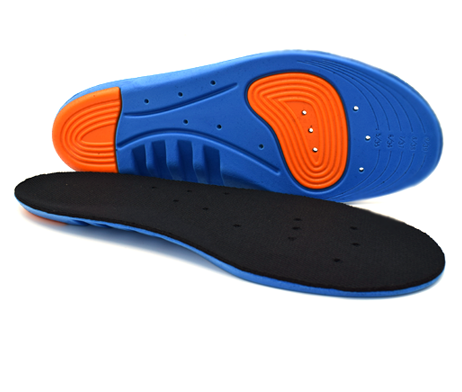 Our sports insoles are lightweight meaning any running enthusiast will not even realize they are wearing them when exercising as they mould to the shape of the feet but at the same time giving balance, comfort and a longer more beneficial workout. When your feet strike the ground as you run this creates a lot of force which can travel into your feet and up into your leg which can cause damage and pain to your feet, ankle and knee joints. This is why it is important to make sure that you buy well-fitting insoles that are shock absorbing and dampen this force so that it does as much less long term damage. Even though the damage that running may cause in the short term may only be minimal the cumulative effect over time can be catastrophic and stress fractures may result overtime. 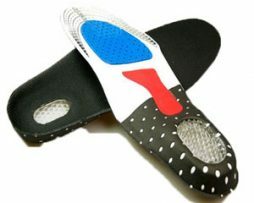 Arch support is very important in any kind of insole. This is because not having the right arch support can cause problems and injuries like plantar fasciitis. Running can put a lot of stress on the bones, ligaments, joints and tissues found in your legs and feet, not having the right protection can cause these stresses and strains to build up which can lead to injury and damage this can be the case for the arch of your foot which is very fragile as it is made up many quite delicate bones and the plantar fascia which is a stretched piece of tissue from the heel right up to your toes. Too much strain can cause this to tear or become inflamed. This is what is known as plantar fasciitis and is something many professional runners can suffer from. The arch of your foot must support your whole body weight as you run and gets put under even more stress and strain and can become more prone to injury. Having arch supports incorporated within your insoles make sure that the arch of the foot can better cope under the extra stress and strain caused by running and reduces the risk of getting plantar fasciitis. Using a pair of our running insoles if you are already suffering from plantar fasciitis is a very good idea as keeping the weight off the plantar fascia and giving it a little extra support whilst it heals, allows it to recover faster and will get you back on your feet in no time at all! The cushioned design of our insole means that your feet will stay warm and comfortable when out running. Not only that but the cushioned padding will also provide stability and balance in the places that you need it the most when running to improve you foot position and your running technique as well. Made from durable PU gel foam providing the insoles with firm support that is also durable enough to adapt to your running and provide the right support and shock absorption as well. How do running insoles help? Our specially made running insoles have been created with runners in mind with shock absorbing qualities to reduce the impact that running can have on your feet. By dampening the shocks that can occur when you run you effectively limit this damage. We offer a comfortable and practical way to help diffuse aches and pains as you run! The support and balance you will get from a pair of our running insoles will redefine how you run giving you more comfort, confidence and also endurance to help you run for longer and more effectively.